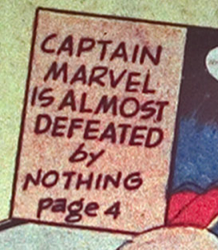 Hey, it’s not The Nothing’s fault that Captain Marvel was having a bad day when they decided to duke it out. Wasn’t The Nothing the enemy in The Neverending Story? Well, it must be something because Jerry Seinfeld made a whole show out of Nothing. Our hero ladies and gentlemen! Jeez, I wonder what happens when he goes up against Something? Now you have to think before you answer the question, “What are you doing?”next time. Logically, that means he is completely beaten by everything.Poor guy. Is being beaten by nothing better or worse than being saved by zero?